Dieses historische Art-Deco-Wahrzeichen am Ocean Drive wurde 1996 restauriert und in eine All-Suite-Luxus-Boutique-Anlage umgewandelt. Queen-Bett, bequeme Lounge-Sofa, Flachbildschirm 37 'HD-TV, Stereoanlage, kostenlosem High-Speed ​​Wireless Internet, Auswirkungen und schalldichte Fenster, Herd Herd, Kühlschrank, Kaffeemaschine, Bad und Dusche, italienischen Fliesen, Parkservice 24 / 7. Diese exklusiven Zugang Gebäude unter Sicherheitsüberwachung mit Blick auf die Sandstrände, Lummus Park, die schöne Promenade, wo man zu Fuß, per Fahrrad oder Inlineskaten zu allen Restaurants, Designer-Boutiquen, Clubs, Equinox Fitness-Studio, eine Apotheke um die Ecke, Lincoln Mall, die berühmte News Café, Monty ist auf den Hafen, die Stadt der heißen Clubs und Bars und auch nur 5 Minuten mit dem Auto oder mit dem Taxi von der Innenstadt Miami, Bayside Shopping Mall und dem berühmten Design District. The building was filled with noisy transient renters during our visit. March and part of April are the times of Spring Break. This building is in the epicenter of milling, scantily clad people drinking and carousing for most of the night. These very noisy young people also rent many of the rooms near this studio. Thet thumping and clanking sounds of people in the stairway and halls continued all night. The watchman told us it is a "condominium hotel", so maybe it is legal in Miami Beach, where short term rentals of condos have been ruled illegal. The city is trying to stop this, and there is now a $20,000 fine if it's a condo short term. There is extremely loud music in an outdoor restaurant in the courtyard of this hotel. The entrance to the condo building is in this courtyard. There were police on the street to control the large crowds, and the road was blocked off so you could not get your car near the front door. Next year the police will be better armed, because this year they could not control things. Check the MIami Herald for details of this matter as well as the problem of short-term rentals in Miami Beach. Apparently so many of the owners of these condos are doing short term rentals that the presence of renters has overwhelmed the building. The owner did not warn us about this situation. We did not find it easy to sleep. I was surprised to hear that Edward wrote this because he never mentioned having any issues during their stay. I have often rented during this time and NEVER HAD ANY COMPLAINTS. I have had a retired couple stay there a previous year during this time from France and another from Italy and THEY LOVED IT! so they and their grandchildren KNEW VERY WELL IT WAS SPRING BREAK. I have been on the board of directors for years and we provide FULL TIME SECURITY GUARD SERVICES during special events. South of 5th where the studio is located is the quieter side of South Beach with high end restaurants. The building has installed DOUBLE PAIN WINDOWS and inside the studio YOU CANNOT HEAR ANY NOISE FROM OUTSIDE. The building is a condo and NOT A CONDO HOTEL, so there is no front desk last minute check-ins allowed. My previous guests have loved their stay! Location is superb. The building reeks of mold and apartment has a bit of that smell, but that's natural in an old building like that. It is on the noisy side, but again that's to be expected when staying in such location. The place was clean and nice and had everything we needed, so no complaints there at all. However, the owner/manager of this property is the reason why I wouldn't go back. She was pushy on her rental agreement (she has a self-imposed 48h deadline for you to sign) yet not very responsive to my questions and generally needs to vastly improve her communication style / customer service skills. The rental agreement is very restrictive and you are basically giving her the right to withhold your security deposit for basically whatever reason. The security deposit was due to be posted back to my account within 3 days of check out - it's been over a week since check out and I am yet to see my money back although we left everything as we found it. "Kristina is EXCELLENT HOST, providing tons of information and suggestions for restaurants and sightseeing well in advance of our stay...we were very impressed with her responsiveness and HOW SHE KEPT IN TOUCH WITH US EVEN DURING OUR STAY!" "KRISTINA HAS BEEN A PLEASURE TO WORK WITH and has answered all our questions promptly." "Room was clean and AMAZINGLY QUIET...and you’re in South Beach!". I immediately try to get in touch with my guests to get to know them & give them information. I tried to call and write this guest many times but she was not answering my calls nor emails. I asked them to contact me to let me know if they arrived safely and if all was okay but did not get a reply. My guests reserve with Homeaway. I do send out a little simple contract that all my guests have never had problems with. Most of my guests become friends and come back regularly. I have rented to all professionals such as attorneys, doctors, professors etc. I always send out a pdf on "ATTRACTIONS" with helpful recommendations about tourism and an extensive pdf about checkin and checkout so my guests are familiar with the building before they arrive. MOLD IS NOT POSSIBLE. I have been on the board of directors for years and we just cleaned the AC of the building and in my studio 2 months ago. The SECURITY DEPOSIT is KEPT HOMEAWAY and not myself. I have no control over the time limit that Homeaway returns the deposit. Lovely efficiency in a beautiful Art Deco building in South Beach. It was wonderful to walk across the park to the beach in the morning and experience ocean drive in the evening. Room was clean and amazingly quiet in a very loud area (you’re in South Beach after all!). Location made it very easy to access a number of really good restaurants. Highly recommend the Cuban restaurant Puerto Sagua on Collins Ave in addition to Joe’s Stone Crab and Pane & Vino. Owner provided detailed information for accessing the apartment including helpful tips for local area attractions. We used beach rentals (umbrella, beach chairs) on South Beach to enjoy the beach. Cannot wait to get back!! 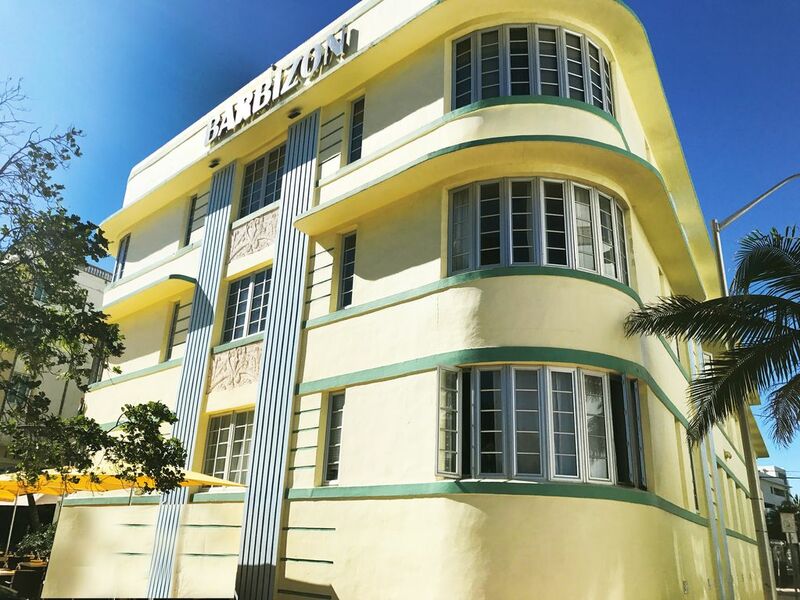 The Barbizon is a great place to stay on Ocean Drive at Miami Beach. The beach is just across the street. The Mexican restaurant out front, Jalapeno, has a great dinner (and breakfast). The location of the Barbizon is perfect. It is in a quiet area of Ocean Drive and is close to everything. The lobby of the Barbizon is very clean with plenty of couches and seats. The apartment we stayed in is also extremely clean. It has everything you may need - including a couch, large comfortable bed, a kitchenette with a dining table & chairs, a large screen tv with many cable channels, and plenty of room for a vacation. I highly recommend staying there! Thank YOU! for staying in my studio. I'm glad you and your husband had a nice time. It's always a pleasure to have nice and clean guests...please come back any time! Francis was a wonderful guest and I am so happy that he enjoyed South Beach and the Barbizon. I was able to let him check in early since his flight arrived in the morning. I hope he comes back! ALL RATES ARE SUBJECT TO CHANGE AT ANY TIME. Daily rate (min 3 nights) is between $90 - $150 DEPENDING UPON THE DATE. Peak Winter Rates October - May 1, MONTHLY RATE : $1000 to $2000. SPECIAL EVENTS MAY BE SUBJECT TO CHANGE : Art Basil, Boat Shows, Wine & Food Festival, Spring Break, Music Festivals, Easter, Christmas & NY, Memorial Day, 4th of July, Labor Day & Columbus Day.